It's National Sticky Bun Day! I think I’ve died and gone to breakfast heaven with these sticky buns. 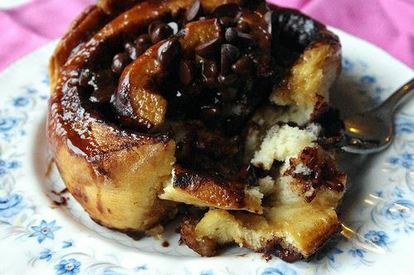 I’ve made cinnamon rolls before but this is a better recipe. The bread component was fluffy as a cloud. To top it all off the sticky buns are covered in a lovely gooey sauce that caramelizes while it bakes. And a few extra chocolate chips tossed on top afterwards for a garnish.